This entry was posted in KSCC, Scouting on 18/04/2018 by Chris. This entry was posted in Events, KSCC, Scouting on 22/03/2018 by Chris. We’re back on the 19th April! This entry was posted in Coaching, Events, KSCC, Scouting, Uncategorized on 20/02/2017 by Chris. So, you’ve been Kayaking/Canoeing, maybe you’ve completed our beginner course last year? This is where it all starts again. We’ll start you off with a bit of a gentle refresher on some of the strokes you’ve done before, just to get you going. You can carry on where you left off from a previous course and begin work on the BCU 2 star award. You can work on switching your skills to a greater level between Kayak to Canoe (or the other way round). You can start working on expedition practice and training for Scouting challenge or awards badges or Duke of Edinburgh’s awards. Try a completely different Canoeing/Kayaking discipline – anything from Canoe Sailing to Kayak slalom or racing. The choice is yours, our job is to lay those foundations and give you the opportunity to have a go and develop from where you are now. This entry was posted in Coaching, Events, KSCC, Scouting on 19/10/2016 by Chris. This entry was posted in Events, KSCC, Scouting on 29/06/2015 by Chris. Thanks for signing up to the Kingston Scouts Canoe Club Fun session for Cubs, please see below for a parental consent form which we will need from the start to keep on record. The swimming section should not rule out those who cannot swim 50m – it is simply so that the coaches and I can keep a slightly closer eye on those who may be weaker swimmers (buoyancy aids are provided for all). The Session is 9.30 – 12.30 on Sunday 21st June. I hope that all this information helps, do feel free to contact me if you have any queries at all. Canoeing activities made available to all Scouts regardless of background, ability or means. This entry was posted in Events, KSCC, Scouting on 06/05/2015 by Chris. This entry was posted in Coaching, Events, KSCC, Scouting on 02/05/2015 by Chris. Thanks for signing up to the Kingston Scouts Canoe Club Fun session for Cubs and Scouts, please see above for a parental consent form which we will need from the start to keep on record. The swimming section should not rule out those who cannot swim 50m – it is simply so that the coaches and I can keep a slightly closer eye on those who may be weaker swimmers (buoyancy aids are provided for all). The Session is 10.00 – 1.00 on Sunday 17th May. This entry was posted in Events, KSCC, Scouting on 10/02/2015 by KSCC. 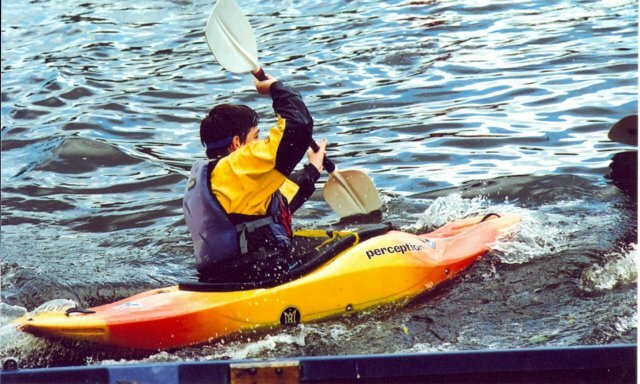 Want to learn kayaking but don’t know where to start? Need kayaking for beginners stuff but the info you find is too advanced? Stop searching, you have arrived at the right place. This course covers all the basics to get you paddling with with tips, safety advice and so much more! There are many reasons why people have made kayaking the fastest growing sport. Outdoor enjoyment, healthy exercise, connecting with friends, solitude, fishing, challenge, adventure, a peaceful escape or just plain old FUN! – what’s your reason? In the many years that Kingston Scouts Canoe Club have been running, we have enjoyed helping others get a good start. We always encourage them to learn a few of the important basics – you know, the “kayaking for beginners” stuff … before hitting the water. Why? Because you don’t want to learn them after hitting the water. Really! This Course starts off with a full Safety brief, a detailed explaination on what to do ‘if’ you do go over and just a gentle warm up to get us in the mood. This entry was posted in Coaching, Events, KSCC, Scouting on 29/01/2015 by Chris. This will be working towards the BCU 2 star award to ensure that you have the necessary training and skills to be able to cope, as a group, with the paddling required when on an expedition in Canoes. This entry was posted in Coaching, Events, KSCC, Scouting on 26/01/2015 by Chris.